As interesting as Origen and Apocatastasis are, my week in Oxford made me realise that I have a lot of other things to focus my mental energy and time on. Like brushing up on Roman history and keeping Latin going. Like the Latin Fathers, palaeography, the history of Latin literature, clausulae, theories and practices of translation – ancient and modern – keeping Greek going, Roman rhetoric, epistolography ….. I have blogged about Origen (184/5–253/4, on his impact see here) and the concept of Apocatastasis before (here), in the context of Rob Bell’s book Love Wins and the debate surrounding universalism. At the time, I was unaware of the use of the word apokatastasis by St. Peter in Acts 3:21, and I boldly declared regarding this theological doctrine, ‘No, it’s not in Scripture.’ My flawed research has been taken to task, for which I am grateful, and now I am going to be thorough, sort of for the fun of it. First, the terms. When referring to the theological concept as espoused by Origen et al., I shall use the Latinised spelling Apocatastasis, capital A, no italics. When referring to the Greek lexical term, I shall use the Hellenised spelling apokatastasis, lower case a, italicised. Second, the method/outline of this project on Apocatastasis. First, I shall discuss what doctrine it is that we are discussing, exactly. What is Apocatastasis? We shall investigate the teachings of Origen and Evagrius Ponticus (345-399) in particular; one of the questions we shall investigate is why their teachings of this name were condemned in the sixth century and suspect in the late-fourth and early-fifth centuries. Two other illustrious Origenists shall be considered, the Cappadocian Fathers St. Gregory of Nazianzus (329–389/90) and St. Gregory of Nyssa (335–394, Saint of the Week here). 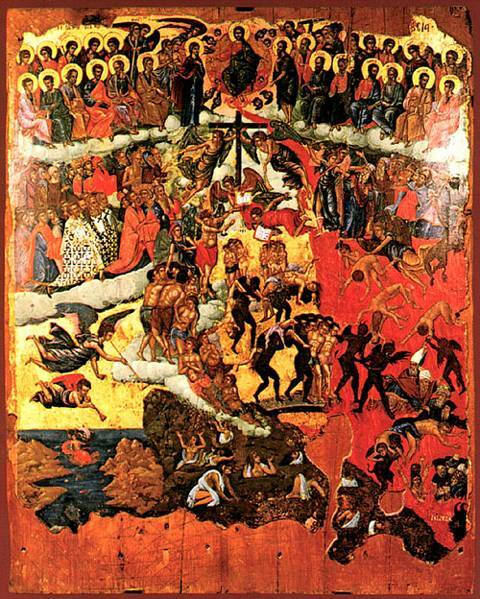 We shall see to what extent their eschatological teachings and understanding of Judgement Day align with the “Origenist” teaching on Apocatastasis condemned in later years. Once we have come to understand what the ancients understood theologically about Apocatastasis, we can consider modern writers and their contemplation of “universalism”. We shall look at Metropolitan Kallistos Ware, Madeleine L’Engle (herself a reader of the Cappadocian Fathers), and George MacDonald (Saint of the Week here, discussion of his “universalism” here). Met. Kallistos is a living Eastern Orthodox Bishop (website here) and patristics scholar who, like most Eastern Orthodox, could easily be considered “conservative”. Madeleine L’Engle was a popular Anglican author of the last half of the twentieth century (website here), most famous for her children’s/young adult novels such as A Wrinkle in Time. The only reason anyone has ever called her heretic is over the question of universal salvation; she is, nevertheless, very popular amongst Christians with a firm belief in eternal damnation. The third is George MacDonald, a nineteenth-century Congregationalist pastor and novelist, the grand inspiration and “teacher” of popular “conservative” Anglican novelist, literary critic, and amateur theologian C S Lewis. I have chosen these three because I believe they highlight different approaches to the question of universal salvation and Apocatastasis as well as pushing us to question the borders of orthodoxy, for all three are popular amongst conservative, orthodox believers, despite the unpopularity in such circles for theology of universal salvation (as we saw in the furor over Rob Bell). We will then have set the stage for understanding this doctrine and how it has persisted to this day in differing guises. Having a clear understanding of Apocatastasis, we can then turn to the Scriptures and see whether or not Apocatastasis is in Scripture. This will be time to play with the writers of the Patristic, Mediaeval, and Reformation eras, part of the point of this blog. We shall look at the occurrences of the word apokatastasis in Scripture, especially in Acts 3:21, but also in the Septuagint, the ancient Greek translation of the Old Testament used by the writers of the Apostolic and Patristic ages, including not only Sts. Peter and Paul, but also Origen (who composed a document called the hexapla that put various editions of the Septuagint in parallel columns with the Masoretic Text of the Hebrew) and the Cappadocians, as well as our friend Met. Kallistos. Our interpretation shall at one level be lexical, giving the basic definition and nuances of the word bare of any text. Then we shall approach each text using the Talmudic exegetical method outlined by Weekend Fisher here. This approach is not entirely suited to the New Testament but will not be profitless. We shall also consider the ancient grammarians’ technique of textual interpretation that believes that the text interprets itself; taking holy Scripture as the entire text – something done early by the Fathers (as recounted by Lewis Ayres in a paper given at the University of Edinburgh in Autumn of 2010) – we shall consider what apokatastasis means both in its immediate context and in the rest of Scripture. Having thus sought to understand the question and passages at hand in their own right, we shall turn to our forebears in the faith. What do they say about the passage? For the Acts passage, we shall look at St. John Chrysostom, the Venerable Bede, and others, relying in part on IVP’s Ancient Christian Commentary on Scripture because life is short and I don’t necessarily have time to scour the library for resources. The relevant Medieval commentators shall be considered as well as the famous Reformation commentators Calvin and Luther. From these considerations, we shall sound out the mind of the Great Tradition as to what St. Peter envisages when he refers to apokatastasis. My hypothesis is that St. Peter’s apokatastasis, his “restoration”, will be similar to St. Irenaeus’ anakephalaiōsis, his “recapitulation.” If so, we shall move the discussion of Apocatastasis into a discussion of Recapitulation and what exactly the difference is. By so doing, we shall re-cover the ground concerning Origen/Origenism, the doctrine of Apocatastasis, and the modern adherents to related ideas. Having done all of this, we will be able to make conclusions about Apocatastasis and whether it is in Scripture, and whether, if not in Scripture, it is compatible with Scripture. By so doing, we shall see what all the fuss was about in the old disputes and what the fuss is about in the new disputes, and we shall get to try out the older ways of reading the Bible advocated on this website. It will be Classic Christianity in action. It will also take up a lot of posts; I have thus created a new category called “Apocatastasis Project” to be able to check them out quickly. Thanks to Rob Bell’s book, Love Wins, universalism is big news these days. Everyone and their dog is chiming in on universalism and Rob Bell. Including, it would seem, me. Universalism has been around a long time. But so has every other heresy. Arius rejected the full deity of Christ and many people followed him. This hardly makes Arianism part of the wide, diverse stream of Christian orthodoxy. Every point of Christian doctrine has been contested, but some have been deemed heterodox. Universalism, traditionally, was considered one of those points. True, many recent liberal theologians have argued for versions of universalism—and this is where Bell stands, not in the center of the historic Christian tradition. My thoughts on the subject are primarily concerned with Origen at present. * Origen’s doctrine of ‘universalism’ is called apocatastasis. This is the belief that at the end of all things, all souls will be reunited with God. Origen does not rule out the possibility that among these souls we may find the Devil. No one is beyond the long arm of God’s great, saving grace for Origen. David at Pious Fabrications points out that others whom we deem quite orthodox — Met. Kallistos and St. Gregory of Nyssa,** to take two big examples — believe in apocatastasis. It is not, then, this belief alone that gets one into a lot of hot, heretical water. In the blog post, David argues that the big difference between Origen and these others is the firmness of his belief on this point. Everyone is saved. Period. Kallistos et al, on the other hand, leave it open. Everyone is saved? It’s a question, a hope, but not stated as a dogma for all to believe. Thus, while the Church may condemn Gregory of Nyssa’s belief in apocatastasis, she will not condemn him. 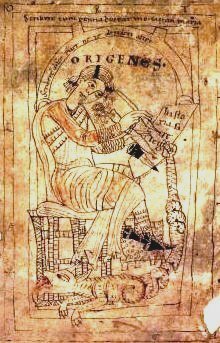 I think there’s also the fact that Origen is one of the great Neoplatonists of the third century to consider. His system involves a type of salvation that the revelation does not present unto us — we are all restored to union with God as disembodied souls that do nothing but contemplate Him and have no distinctive individuality. Origen, then, is more than a case of damnation by punctuation. Origen has an entire system of cosmology, large portions of which are incompatible with Scripture. This is the ultimate cause of his anathematisation at the separate sessions led by Justinian and the bishops at the Second Council of Constantinople (Fifth Ecumenical) in 553. Ultimately, the Church cannot affirm apocatastasis and other forms of universalism because either they run counter to Scripture and are pieces of speculation or they involve bad hermeneutics. As DeYoung’s excessively long review, cited above, shows us, Love Wins involves bad hermeneutics. Still, ought we not at least to hope for apocatastasis? Maybe, in the end, God will redeem everyone. No, it’s not in Scripture. What we find in Scripture regarding those who die outside of the Faith is varied and largely unpleasant. Nevertheless, to hope for the salvation of all is not an un-Christian hope, even if one finds the possibility unlikely, even if one thinks that it ought not to be preached loudly from pulpits or ensconced as dogma. *George MacDonald will hopefully be the subject of a later post, if all goes according to plan. **He lists all three Cappadocian Fathers, but I haven’t heard elsewhere of Sts. Basil and Gregory the Theologian believing this. Until I have corroborated it, I can’t print it. On the Quicumque Vult (pt 2): Religion Gone Bad? Yesterday, I successfully placed the so-called “Creed of Saint Athanasius” or “Quicumque Vult” in its context. It has lived beyond its context, surviving in books and documents and liturgical use — traditionally, Anglicans recite this statement of faith every Trinity Sunday. I don’t think very many do, anymore, and not just because of the equation: length + liturgical laziness = cutting out bits of the liturgy. Whoever wishes to be saved, it is necessary before all things, that he cling to the Catholic faith: unless someone will have held this [faith] whole and undefiled and away from falseness, he will perish eternally. The offending clause is the closing one, “he will perish eternally.” No one wants to hear this sort of thing today. Isn’t this the sort of thing Fred Phelps is into? Isn’t this what a lot people are trying to get away from? Doesn’t this just prove that religion is an oppressive, divisive force? What does it even mean, “perish eternally”? Most people are probably thinking, “Hellfire and brimstone! Hellfire and brimstone! HEAVEN! OR HELL!! HEAVEN!! OR HELL!! !” I don’t rightly know, actually. It seems that those who are not caught up into the great embrace of Christ in the great beyond, those who find themselves amongst the goats on Judgement Day, are described variously as being cast into the outer darkness where there is moaning and gnashing of teeth, or into Gehenna which is Jerusalem’s burning garbage heap, or into a lake of fire, or to suffer the second death, or simply to be sent away from the presence of Christ. Whatever it is that happens to those who find themselves outside of Christ at the Resurrection, it is not something to look forward to. Perhaps it is simply the cessation of existence. St. Augustine seems to think it is eternal punishment. Madeleine L’Engle can’t imagine a good God punishing any of His creation for all time; neither can St. Gregory of Nyssa. Origen even imagined that the people who die the second death and go to Hades are raised up and perfected by Christ and reunited to the Monad at the end of all things (apocatastasis for those who care). Whatever it is, though, we freely choose it. We pave our own road to Hell. We choose ourselves over others, the world over Christ, sin over righteousness every step of the way. And this road we pave is easily laid. It’s also nice and broad, smooth and pleasant. Until, of course, we reach the top of a hill and are tossed off the hill by demons into a pit of dragons (this description based on an icon I saw in a supermarket in Cyprus). God offers the free gift of salvation to everyone. If we choose not to accept it, we are condemning ourselves to perish eternally. Of course, protestations arise that that’s not what the Quicumque Vult says. It says that we must keep the Catholic faith whole and undefiled. We must also do good works, according to the conclusion of the text. The Catholic faith is the means of accepting the gift of salvation. If God is offering us a gift, we must have faith in Him to accept it. If I did not have faith in my brother, I might not accept a gift given by him, expecting instead of something pleasant those springy snakes instead. So faith, as in trust, is essential for accepting the gift. Part of accepting this gift is knowing the giver. God is not aloof from us. He offers us salvation, and if we truly trust* Him, we will come to know Him. We will learn of Who He is. And Who is He? Who is this God whom we trust, this God Who saves us from sin, death, the devil, eternal perishing? Look at the Quicumque Vult. It will show you Who it is Whom you trust. *Philological phun phact: these two words are cognate along with tree. This past Tuesday at the Classic Christian Small Group, we read George MacDonald’s Unspoken Sermon, “The Higher Faith.” George MacDonald (1824-1905) was a Scottish Congregationalist pastor who had an influence upon CS Lewis — this was how he came to my attention. He was the son of a farmer, probably one of the first in his family to go to university. Lewis, in the brief biography he wrote for George MacDonald: An Anthology that is also at the beginning of most editions of Phantastes , says that George MacDonald, Sr., was a good father who made a strong impression on the younger George. This would come to influence MacDonald’s view of the Fatherhood of God, for someone with a strong father figure has difficulty fathoming why anyone would not be able to envision God as loving Father. He studied at Aberdeen University and then at Highbury College, London. He was ordained as a Congregationalist pastor, taking on his first parish in 1850 in Arundel, West Sussex, England. After three years at Arundel, MacDonald resigned. He and the governing body of the congregation had some theological difficulties. They had cut his salary in a move to make him resign; for a while, the average parishioners were still supporting MacDonald with goods, but it was not enough, so he resigned. The theological difficulties sprang mainly from MacDonald’s rejection of the Calvinism of his youth, including predestination. George MacDonald believed that everyone could be redeemed. Everyone has a shot at Heaven, even those who in this life profess no belief in Christ. MacDonald believed that everyone is given an opportunity to ultimatel accept or reject Christ in the next life. This belief differs from Christian universalism (or apocatastasis) because that doctrine teaches that Christ’s death on the Cross teaches that Jesus saves all, not that Jesus can save all. It is an important distinction. A brilliant telling of this view is in CS Lewis’ The Last Battle ‘s final chapter with the Calormene in Heaven. After leaving active ministry, MacDonald and his wife (whom he wed in 1851) went to Algiers for health reasons. When they returned to England, MacDonald tutored, wrote, and occasionally preached for a living. This means that he was perennially poor and often relied on the charity of his friends to survive. He published some poetry in the 1850’s, but he did not meet with real success until the 1860’s when he published stories of Scottish country life — often including real Scots dialect! In the 1870’s he took the opportunity to tour the USA where his teaching was well received. Although offered incentives to stay on the western side of the Atlantic, he returned to England where, as of 1877, Queen Victoria pensioned him, thus ending his money woes. In 1881, he and his wife returned to the Mediterranean for health reasons, this time moving to Italy. They stayed there until 1902 when his wife died — yet she lived to see the Golden Wedding Anniversary. MacDonald returned to England where he died on September 18, 1905. His remains were transported to Italy and buried with his wife’s. MacDonald’s most popular writings are Phantastes (1858), At the Back of the North Wind (1871), The Princess And The Goblin (early 1880’s), The Princess And Curdie (1883), and Lilith (1895).